Diane on Whidbey Island: The Studio Commissary Exclusive- "Pour Vous"
When I was asked again this year to make an exclusive outfit for the Studio Commissary I was thrilled. Of course I was flooded with ideas. I finally decided to make a blue version of an outfit that I had made back in early 2012. I hadn't made the pattern for it yet, so I decided to kill two birds with one stone. I present to you "Pour Vous". I didn't come up with this fancy French name myself. Mike, the owner of the the Studio Commissary did. I never name my outfits, though I wish I had the creativity to do it. The original name for this ensemble was "Suit with 2 Collars". Isn't that romantic? Usually I am inspired by designers and films. 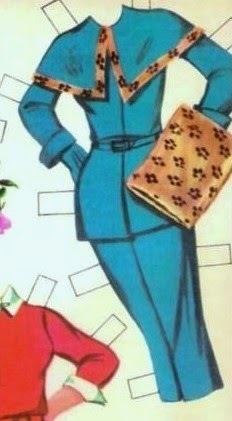 This time I was inspired by a vintage paper doll suit. I added the turban instead of trying to replicate the original paper doll hat. I rounded the collar to make it easier to sew. This is the first version I made of this design back in 2012. I love this leopard velour fabric. It was perfect for this outfit, but sadly I used it up. I also wasn't happy with the fit of this version. It was on the big side for Gene. I ended up making the jacket more fitted. 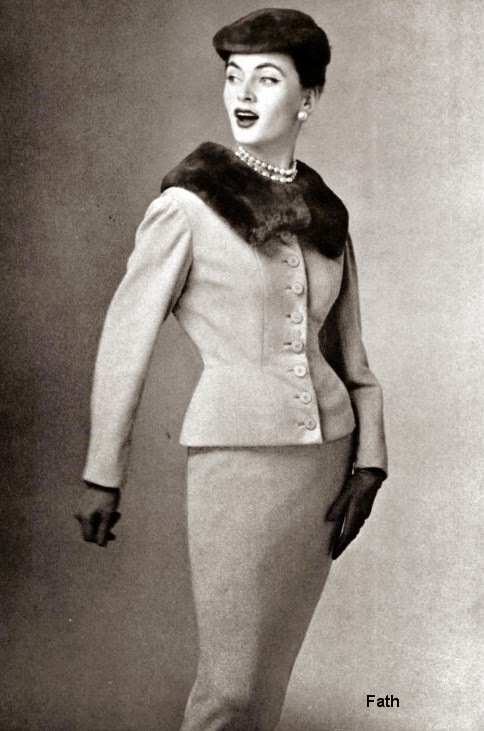 I was also inspired by this 1954 Jaques Fath design. So I added a fur hat and collar to get this look. The only thing missing is the buttons. I wasn't sure I would like this suit without the belt, but I really do. I added fur cuffs for the heck of it. Tornado is one of my favoirte models since I painted her lips. This is the 2012 version. The next several pictures are different looks than can be made with all the accessories. There are a few more combinations I thought of after I did this photo session. Which look do you like the best? These are really lovely, but the cream and leopard/black are far and away my favorites! To be honest I can't choose a favorite, all the looks are stunning. So elegant and perfect, I love this design!